An extremely fun, interesting guitar-like MIDI instrument. Perfect for guitarists struggling with MIDI keyboards. Takes the slog out of MIDI composition. Flexible feature list. Great value. Fun! The frets are made of a rubbery substance, as are the 'strings', which are fixed to the fretboard - that's some low action! 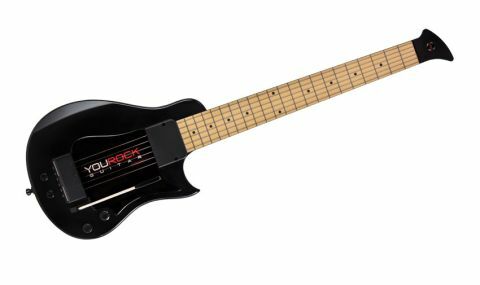 It looks like an upmarket Guitar Hero controller - and it can actually be used for that - but the You Rock Guitar/MIDI controller offers much more. It's a serious instrument for practising and recording guitarists, and might even work onstage, too. "It's not a guitar as we know it, but if you're a guitarist, you can play the You Rock"
The plastic-bodied instrument comes in two parts for transport, with a neck that easily slots into place. It's not a guitar as we know it, but if you're a guitarist, you can play the You Rock. The touch-sensitive neck has a fairly normal fret spacing, but the frets are made of a rubbery substance, as are the 'strings', which are fixed to the fretboard - that's some low action! Your other hand gets a more conventional span of strings, with adjustable tension to pick or strum. You have four connecting options: a standard jack socket and a headphone output for internal sounds, USB for computer control, and a MIDI socket to connect to compatible sound modules. Playing it takes a bit of getting used to - but you'll get past the eccentricities in no time. You can't bend strings for one, but waggle the whammy bar and you'll get a similar effect, while the joystick offers vibrato-style modulation. There are also a few switchable modes: Tap unsurprisingly lets you play by just tapping on the fretboard, and Slide lets you move smoothly between notes. "Through MIDI, you can also use the You Rock Guitar to play a connected synth or sampler"
The onboard sampled sounds are stored in presets, and there are 15 guitar sounds and 15 synth sounds that can be layered together. Through MIDI, you can also use the You Rock Guitar to play a connected synth or sampler. The notes track very well like this, because you're sending a direct MIDI signal rather than converting a real guitar sound as you would with a MIDI guitar pickup. You can also use the instrument to control software by configuring the fretboard as an array of switches. All that's pretty advanced, however, and you could keep yourself amused for some time just using the onboard backing tracks and built-in recorder, plus the instantly switchable open tunings. In fact, there's loads here that we just don't have room to fully describe, but there's more than enough to keep you entertained. Computer recording has given us all the opportunity to create our own unique tracks, but if you don't want to use samples, putting backing tracks together using MIDI data can be painstakingly slow using a keyboard or your computer's keys. If you're more at home with a guitar neck, the You Rock Guitar could be a relatively affordable way to make the process less of a slog - it's not bad as a practice tool, either. And given that it easily fits into a backpack, simply partner it with a set of headphones and you can get those fingers working anywhere. All that, and it never needs tuning!